A three-year-old girl, shot in a road rage incident back in October in Port St. Lucie, appeared at a news conference on Friday afternoon. "It's a miracle she's alive," said Nikki Jenkins, Preslie's mother, who brought her daughter out in a wheelchair. "She's a fighter, she's a pistol." Police say Preslie Jenkins was sitting in her car seat in the overnight hours of Oct. 28, when a bullet struck her in the head. Since then, she's been recovering at the Palm Beach Children's Hospital. Her family shared a video earlier this week, showing her walking for the first time since the shooting. 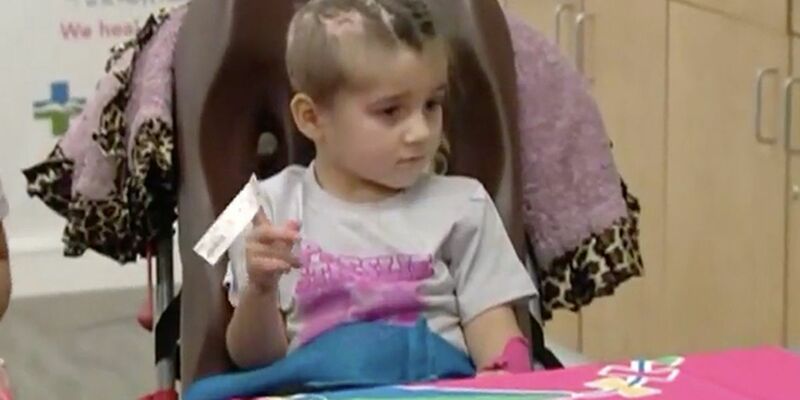 Friday's news conference started with doctors giving an update on Preslie's condition. "She was really on death's door when she came in," said Dr. Lauren Schwartz, a pediatric neurosurgeon who treated Preslie when she got to St. Mary's Medical Center. "She's a fighter." Dr. Craig Lichtblau, the medical director of Pediatric Rehab Services said Preslie was functionally "zero" when she got to rehab, but with aggressive therapy, she's now able to speak and move. Police have not made any arrests in the case, but they're looking for a black BMW with side blinkers in connection with the shooting. "Just come forward," Nikki Jenkins said at Friday's news conference, urging the shooter to turn themselves in. "She deserves justice, and we want to make sure this doesn't happen to anyone else." If you have any information that can help detectives, call the Port St. Lucie Police Department at 772-871-7324, or call Treasure Coast Crime Stoppers at 1-800-273-8477.